Looking for a quick and easy weeknight dinner? 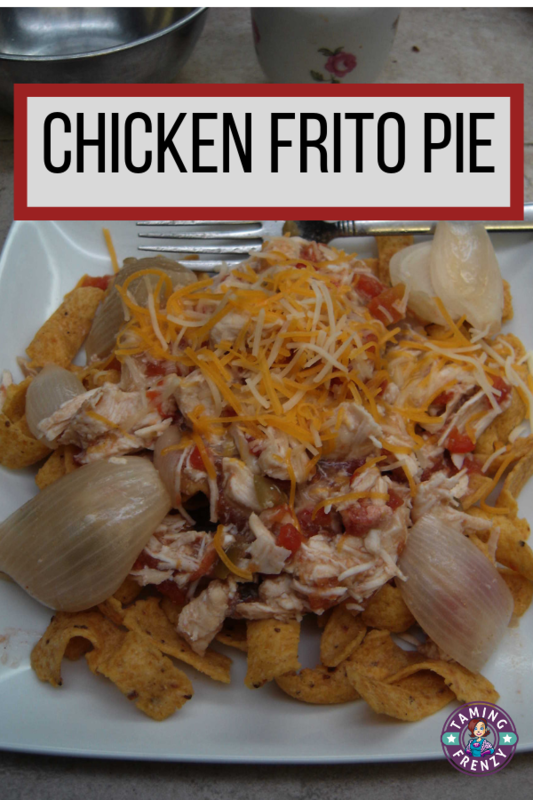 Throw the ingredients for Chicken Frito Pie into your slow cooker and you’ve got a tasty meal with hardly any work at all on your part. Does it get any better than that? This post contains affiliate links. That means if you make a purchase through a link I make a small commission at no extra charge to you. I used to love football games in the fall because concession stands frequently had Frito Pie on the menu. Traditional Frito Pie, as it was served at football games, was simply heated chili that was spooned into a small bag of Fritos. The bag served as the serving dish and it was delicious on a cold night. And it was fun to eat out of the bag! Grownup Frito Pie isn’t served out of a Frito bag (at least at my house!) but it’s still a favorite. I’d been thinking about way to tweak the recipe an decided that chicken and cheese would be just the ticket. I served it to Jungle Jim (who is the gourmet at my house) and he declared it a “keeper”. Hopefully your family will like it just as much as we did. The fact that it took me about 5 minutest to throw the ingredients in to cook, and then about 5 minutes to get it on the plate, means that I’ll definitely be serving it again. Put chicken, tomatoes and green chilies, garlic powder, and pepper into crock pot. Cook low 6-8 hours or on high 4-6 hours. When chicken is cooked, drain the clear juices out of the crock pot. Add green enchilada sauce and turn crock pot to high temperature just long enough to heat through. Serve chicken mixture over Frito corn chips. Top with shredded cheese. This is also good garnished with sour cream. Other garnish ideas would be salsa or avocados. Do you have a “go to” recipe you like to make when your family is super busy? I’d love to know what it is. And if you like this recipe, I’d love for you to share it with your Facebook friends or on your Pinterest board. I spend many nights at the concession stands when my kids were young, but never heard of Chicken Frito Pie. My kids would have loved that. This sounds so good. Our concession stands were always just canned chili poured over the bag of Fritoes. But I just have this urge to play around with recipes to see what can be concocted. Too much time listening to the men at my house say things like, “Recipes are for sissies.” Oh well, this experiment turned out well. You’ve brought a smile to my face and good memories of my own with the Frito pie story. Your recipe does look like a keeper and perfect for dinner when things start to get hectic! Love having these kinds of recipes to choose from on those days! Thanks for sharing – looking forward to serving at my house soon 🙂 Appreciate you stopping in and sharing with us this week at Snickerdoodle! Pinning 🙂 Have a great week Shelley! I totally agree, Laurie. There is no such thing as too many quick and easy recipes for when things go from busy to frantic. I hope your family enjoys the dish as much as mine did. I suspect that when I was younger the bag was definitely part of the appeal! There was something about that little Frito package and plastic spoon that was lots of fun.